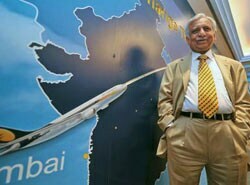 Naresh Goyal may be the poster boy of India’s post-reforms civil aviation industry, but the last year has not been a great one for him. Naresh Goyal may be the poster boy of India’s post-reforms civil aviation industry, but the last year has not been a great one for him. First, several senior and middle managers quit Jet Airways to join liquor baron Vijay Mallya’s Kingfisher Airlines, which has, within three years, stolen the limelight from Jet on service parameters. Worse still, after Mallya’s acquisition of Air Deccan, the Kingfisher Airlines Group, with a share of 28.4 per cent of the domestic market, is breathing down the neck of Jet Airways Group (Jet and JetLite), which had a share of 29.1 per cent of the domestic market in May 2008. But considering that an airline executive admitted that Jet, which, like all other airlines, is grappling with high ATF costs, actually loses money on every seat it sells, a loss of market share may not be such a bad thing. Goyal, who is desperately hunting for funds for Jet Airways’ expansion, has seen those plans stymied. The Jet Airways stock was trading at Rs 535 when Business Today went to press, less than half its issue price. The massive decline in Jet’s valuation, coupled with the current market slump, has forced Goyal to put off a planned $400-million (Rs 1,720 crore) rights issue several times. Of course, the biggest loser in all this has been Goyal himself. A London-based NRI, he has seen his wealth drop from an estimated £780 million (which assured him a place in the top 100 of The Sunday Times Rich List in Britain) to an estimated wealth of £420 million (placing him outside the top 200). In addition, the JetLite acquisition has also turned sour and a war of words has erupted again over tax liabilities arising from the sale where both Sahara and Jet claim that the other party will have to pay Rs 100 crore as tax. However, Goyal has faced trouble before and survived. The man from Patiala slept in his uncle’s office as a young man and rose to the top despite hurdles. Things may be bad today, but Goyal is more than a capable pilot for his airline.